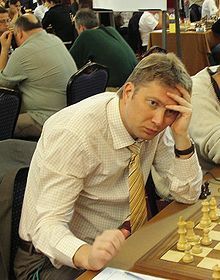 Alexei Dmitrievich Shirov (Russian: Алексей Дмитриевич Широв, Latvian: Aleksejs Širovs; born 4 July 1972) is a Soviet-born Latvian chess grandmaster. He has consistently ranked among the world's top players since the early 1990s, and reached a ranking as high as number two in 1994. Shirov is also a well-regarded chess author. Shirov became the World Under-16 Champion in 1988, the World Under-20 Vice-Champion in 1990 (second on tiebreaks to Ilya Gurevich), and achieved the title of Grandmaster in 1990. Shirov is the winner of numerous international tournaments: Biel 1991, Madrid 1997 (shared first place with Veselin Topalov), Ter Apel 1997, Monte Carlo 1998, Mérida 2000, Paul Keres Memorial Rapid Tournament in Tallinn (2004, 2005, 2011, 2012, 2013). He won the 2005 Canadian Open Chess Championship. In 1998 Shirov's ranking rose to number four in the world. On the basis of his rating, he was invited to play a ten game match against Vladimir Kramnik to select a challenger for World Champion Garry Kasparov. Shirov won the match with two wins, no losses and seven draws. However, the plans for the Kasparov match fell through when sufficient financial backing could not be found. 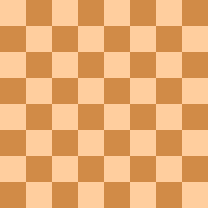 When Kasparov instead played Kramnik for the world title in 2000, Shirov maintained that the match was invalid and he was the rightful challenger. In 2000, Shirov reached the final of the FIDE World Chess Championship, losing 3½-½ to Viswanathan Anand. In May-June 2007 he played in the Candidates Tournament of the FIDE World Chess Championship 2007. He won his first round match against Michael Adams (+1 −1 =4, won in rapid playoff), but was eliminated when he lost his second round match to Levon Aronian (+0 −1 =5). In November-December 2007 Shirov played in the Chess World Cup 2007. He made the final, but lost the final 2½-1½ to Gata Kamsky. In May 2009, Alexei Shirov achieved one of the greatest triumphs of his career by placing 1st in the Category 21 M-Tel Masters 2009 tournament, a double round tournament held in Sofia, Bulgaria. He went undefeated while scoring 6½/10 - seven draws and three victories, two against Vassily Ivanchuk and the other against Magnus Carlsen in the final round. By coming in 1st at M-Tel 2009, he was also given the opportunity to play in the Grand Slam Chess Final 2009 in Bilbao where he met Levon Aronian, Sergey Karjakin (winner of Corus 2009), and Alexander Grischuk (winner of Linares 2009). After his performance at M-Tel 2009, Shirov was ranked No. 5 in the world with a virtual Elo rating of 2763.9, his highest rating ever. In September 2010, Shirov participated in the Grand Slam Chess Masters preliminary tournament in Shanghai from September 3 to 8, where he faced world No. 4 Levon Aronian, world No. 5 Vladimir Kramnik, and Wang Hao; the top two scorers qualified for the Grand Slam final supertournament from October 9 to 15 in Bilbao against world No. 1 Magnus Carlsen and world champion Viswanathan Anand. After drawing his first two games, Shirov then won three consecutive games, including his first victory over Kramnik since 2003. Finishing with 4½/6, Shirov won the tournament, qualifying along with Kramnik for the Grand Slam final. In May 2011, Shirov won a strong GM round-robin in Lublin, Poland, the III Lublin Union Memorial 2011 with a score of 5/7. In October 2011, Shirov announced that he will be switching back to Latvia before a blitz match with Alexander Morozevich. In February 2012, Shirov won the Aivars Gipslis Memorial in Riga with 8 points out of 9. In June 2012 Shirov won the Buenos Aires Masters Tournament, cat.13, with 5½/7. In August 2013, he played in the Chess World Cup. He won his first round match against Hou Yifan, but was eliminated when he lost his second round match to Wei Yi. In August 2015, Shirov won the 5th Riga Technical University Open on tiebreak over Robert Hovhannisyan, after both players finished on 7,5/9. In 1994 Shirov married an Argentine, Verónica Alvarez, moved to Tarragona, and became a citizen of Spain. He was married to Lithuanian GM Viktorija Čmilytė from 2001 to 2007. Shortly before the Shanghai 2010 tournament, Shirov got married for a third time to WIM Olga Dolgova. At that time he still played for Spain, but he and his wife also had an apartment in Riga, Latvia. As of January 1, 2012, he plays for Latvia again. Shirov is noted for his attacking style and for seeking complications, a tendency which has led to comparisons with fellow Latvian and former world champion, Mikhail Tal, under whom he studied in his youth.